Th e M Rep o RT | 51 O r i g i nat i O n s e r v i c i n g a na ly t i c s s e c O n da r y m a r k e t ANALYTICS the latest investment Opportunities Open in Promising real estate markets A market study finds the top markets primed for investment due to expectations of continual home price gains. e merging real estates markets offer investors promising returns on increasing home prices, as foreclosure housing opportu- nities are nearly non-existent. A report from HomeVestors and Local Market Monitor identi- fied the top 10 markets that are most attractive to investors during the third quarter. Atlanta, Georgia; Charlotte, North Carolina; Fort Lauderdale, Florida; Riverside, California; and San Diego, California were among some of the new markets men- tioned on the 2015 Best Markets Top 10 List. The list examined and ranked almost 300 markets by strength of rental markets where home prices are likely to increase steadily over the next few years. This will re- sult in better returns, since home bargains will be harder to find. "The boom in snapping up foreclosed properties is pretty much over," said Ingo Winzer, president and founder of Local Market Monitor. She continued, "Our Top 10 list consists of growing markets where higher home prices already signal more demand than supply, and where renters are at least a third of the local population. With the exception of Atlanta, where bargains still exist, home prices are pretty much aligned with local income." The third-quarter 2015 Best Markets Top 10 list: 1. Orlando, Florida—the large and growing tourism industry pro- vides plenty of lower-paying jobs. 2. Dallas, Texas—growing rapidly, with lots of jobs in business ser- vices and finance; many renters despite fairly modest home prices. 3. Riverside-San Bernardino, California—growing again after a big real estate recession. 4. Seattle, Washington—high home prices give many renters little choice; economy is doing very well despite a moribund manufac- turing sector. 5. Austin, Texas—as with other Texas markets, not enough con- struction in the past decade; strong demand for rentals from govern- ment and university workers. 6. Fort Lauderdale, Florida—re- newed growth in a market with a large retirement population and service providers. 7. Charlotte, North Carolina—the large banking and business services sectors provide ample medium-pay jobs; home prices are moderate but many prefer to rent. 8. Atlanta, Georgia—recovery from the large number of sub- prime foreclosures has produced more renters; some bargains can still be found. 9. San Diego, California—high (but not outrageous) home prices produce a large renter population; the large business services sector— with medium-pay jobs—provides growth. 10. San Antonio, Texas—increased tourism boosts demand for rentals. "Real estate investment op- portunity is widespread," said Ken Channell, HomeVestors co-president. "There are locations with great potential from coast to coast, in the biggest markets and in smaller cities, if you evaluate carefully." 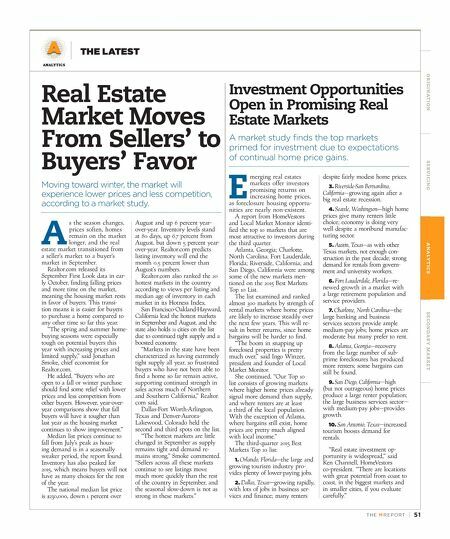 real estate market moves From sellers' to Buyers' Favor Moving toward winter, the market will experience lower prices and less competition, according to a market study. a s the season changes, prices soften, homes remain on the market longer, and the real estate market transitioned from a seller's market to a buyer's market in September. Realtor.com released its September First Look data in ear- ly October, finding falling prices and more time on the market, meaning the housing market rests in favor of buyers. This transi- tion means it is easier for buyers to purchase a home compared to any other time so far this year. "The spring and summer home- buying seasons were especially tough on potential buyers this year with increasing prices and limited supply," said Jonathan Smoke, chief economist for Realtor.com. He added, "Buyers who are open to a fall or winter purchase should find some relief with lower prices and less competition from other buyers. However, year-over- year comparisons show that fall buyers will have it tougher than last year as the housing market continues to show improvement." Median list prices continue to fall from July's peak as hous- ing demand is in a seasonally weaker period, the report found. Inventory has also peaked for 2015, which means buyers will not have as many choices for the rest of the year. The national median list price is $230,000, down 1 percent over August and up 6 percent year- over-year. Inventory levels stand at 80 days, up 6.7 percent from August, but down 5 percent year- over-year. Realtor.com predicts listing inventory will end the month 0.5 percent lower than August's numbers. Realtor.com also ranked the 20 hottest markets in the country according to views per listing and median age of inventory in each market in its Hotness Index. San Francisco-Oakland-Hayward, California lead the hottest markets in September and August, and the state also holds 11 cities on the list due to continued tight supply and a boosted economy. "Markets in the state have been characterized as having extremely tight supply all year, so frustrated buyers who have not been able to find a home so far remain active, supporting continued strength in sales across much of Northern and Southern California," Realtor. com said. Dallas-Fort Worth-Arlington, Texas and Denver-Aurora- Lakewood, Colorado held the second and third spots on the list. "The hottest markets are little changed in September as supply remains tight and demand re- mains strong," Smoke commented. 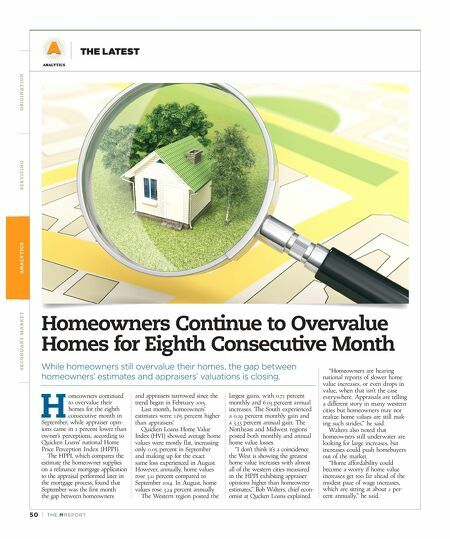 "Sellers across all these markets continue to see listings move much more quickly than the rest of the country in September, and the seasonal slow-down is not as strong in these markets."